Perey + Bumgarner + Fashion on Mothers Day at Spiral; Sofitel Manila! They were introduced one by one. Here's a parade of the fabulous chefs who are preparing their Mom's special dishes. Chef Eric Costille, Chef De Cuisine Western Anne Cecile Degenne, Chef Mok Chee Wah, Chef Hiroaki Yamaguchi and Chef Halim Ali Khan. I loved the Paella that Chef Anne prepared the last time and I'm sure that's probably a hit! After the introduction, a fashion show ensued right in the heart of Spiral and boy oh boy I wasn't wrong about their gorgeous creations! Don't they look like an army of colorful angels?! These gorgeous drapery done in different ways and different colors is the handy work of Ms. Pia Gladys Perey. From Australia, Southeast Asia and LA, Ms. Perey has been known to make clothes that exudes confidence, boldness, ones that are ready for any event or red carpet. I particularly love this one and I'm also crushing on this Model... Alisa Sazonova :) Her cheek bones, overall physique, it's perfect. I think I've shot her before because she's part of Elite Manila. This is her no? =) Small world indeed! These ladies looked so chic. I love how the pieces hug to their bodies and felt so relaxed; and look how soft these clothes look on them. The details on each corner of the dresses too are painstakingly done right, it must have taken them a long time to get this finished. It's an awesome collection indeed Ms. Pia Gladys Perey, I would really love to visit your atelier sometime soon to see more of these creations! Then it was time to show Daniel Mark Bumgarner's clothes. You must have seen him in a couple of races before; but this time, he's letting his creative side all out on this ingenious collection. He's dressed stars here and there; and has been part of some prestigious shows here and abroad just like Ms. Perey. His aesthetics as I have recently seen delved into cuts, structures and fabric pieces over another. His, is a more modern cocktail/night out looking dresses. It looks quite perfect for the modern Filipina. I can imagine this being worn on clubs, work or simply when you have a date and you just got to dress to impress. He doesn't also hold back on colors; and it's nice to see that he's got some pieces with LOTS of details on them specifically this black, gold and white number. Then another barrage of celebrity Moms who played muse to these very talented designers also appeared. Still gorgeous as ever, Alice Dixon can still feel it. She's really a sight to behold! Congratulations to Ms. Pia Gladys Perey and Daniel Mark Bumgarner for their wonderful collection. I can't wait to see the next event on Spiral's grounds. Sofitel Manila is surely outdoing itself one event after another. I wonder what's up their sleeve? Oh, I almost forgot... they've got the new ENTER TO WIN Contest available on their Facebook page. 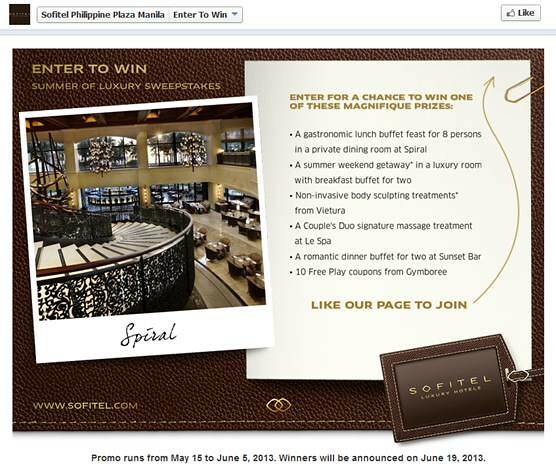 You just simply like the Sofitel Manila or Spiral Manila page and click on the ENTER TO WIN application located on these pages. Fill up the required details and you can win buffets for 8 people, a summer weekend getaway in a luxury room with free breakfast for two, non invasive body sculpting treatments from Vietura, a couples "DUO" signature treatment from Le Spa, a romantic dinner for 2 at Sunset Bar or 10 free play coupons from Gymboree. It's easy, its fun and you can get one of these prizes! Click on the image or click here.